My auto gearbox is slipping in second gear. It was not the cas last week but i could hear a little squeal when i accelerated. Could it be incorrect fluidlevel or is one of the brakebands maladjusted ore something like that? It could be the front band out of adjustment, or the failure of one of the seals in the front servo. Both jobs can be done without removing the transmission. is that the procedure that works? these are changeable with the box in the car?? that would be excellent. or should I follow The manual page 285 44.34.07? and renew the mentioned o-rings that may be part of the kit...? I looked at wins for example but they are not listed as a kit does anyone know wher eto buy the seals for the front servo of a bw65? I have no ramp at my disposal so i have to wait till wednesday. A friend of mine has one and he will return then. I really hope it is just the adjustment of the brakeband. Just to be sure although i think the car drives ok in 1st and 3rd gear it slips( most evident) in 2nd gear. Although it drive ok in the other gears it could be the brakeband? Just to be sure although i think the car drives ok in 1st and 3rd gear it slips( most evident) in 2nd gear. That would seem to be the case. If the problem is the adjustment or the servo it can be fixed with the transmission in the car, if the band itself has failed and needs replacement the transmission will have to be removed. The front band is easier to change than the rear. So my questions: What tool can I use to adjust the adjustmentbolt? Is that a 5/16 " wrench? Or do you use something else? I hope that will do the trick! today I adjusted the brakebands accoording the manual. But it still slips in second!!!!!!! I don't know what to do now. Is ther somewhere a how to for replacing the seals of the front servo or should I go for a total rebuild? Is the fluid brown and burnt? You could always drop the sump and see if there are lumps of friction material in there, if so the band has probably delaminated. Thanks for the replies. I think i have to rebuild the BW65 but that is rather costly about 1000 euro's here in the Netherlands. But now I got in conatct with a bloke that has a GM180 for mee for 300 euro's. He says it is a straight bolt on with minimal modifications to be made. will the speedo still work?? turns out the the box i bought is from a SD1. It has a different speedodrive as far as I can see. is the rear end interchangeable with that of a rover BW65? You could use the SD1 box without stripping it, there are some modifications that need to be carried out on the original P6 "donor " box but these are straightforward enough if you or someone can do machining works. Your speedo drive gear from the P6 has to be machined on the inner circumference to suit the output shaft of the SD1, your P6 output flange for the prop shaft will fit on the SD1, but you will need a longer bolt as the flange is longer than than the SD1 but the output shaft is shorter. So remove both tail cones, remove both speedo drive gears and modify the P6 to the same internal size as the SD1. Obtain a longer output flange bolt. That's handy to know, but in this case I can't see how doing that to a used box with an unknown history is easier than changing the servo seals on the original box, or at worst, replacing the front band. If that's your thinking I can't see why you would buy a used box be it SD1 or P6B in the first place, always better to work with what you already have or you could end up spending more on knackered boxes than actually repairing yours. yes it is a bit of a dilemma......... 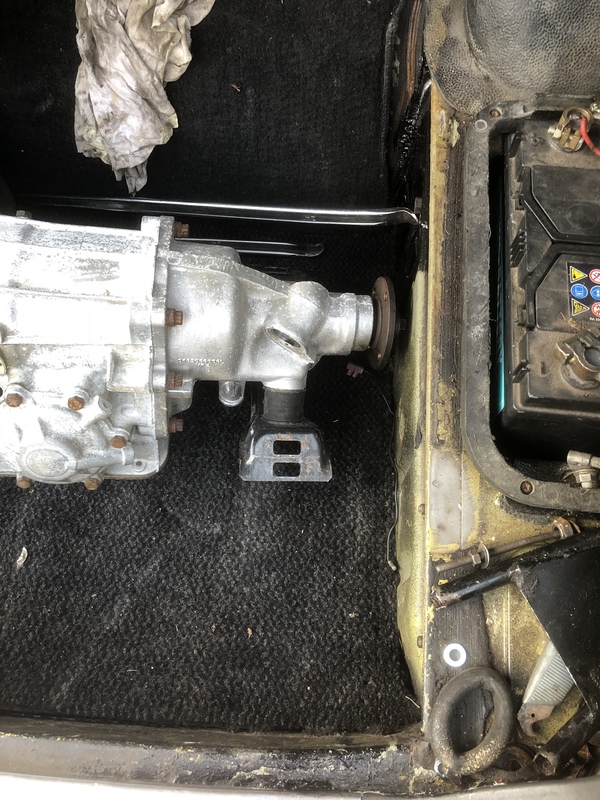 The SD1 gearbox is supposed to be good. It was once sold by the chairman of the ROCH ( Rover owners Club Holland) Johan Löwik. I trust him. He has also a reputation to maintain. So I think that box will be alright. My own box I really don't know anything about since I have owned the rover only half a year and have driven it only for a month. The gearchanges were very smooth that is what I observed and also Jaap Weidema a known P6 enthousiast in the Netherlands thought so. I am pretty familiar with spanners and so on but never tackeld an automatic gearbox. Hence my hesistation to open one up. But if I am not mistaken the only thing I will have to do with the existing box (still fitted in the car) is to remove the lid of the servo on the RH side of the gearbox and replace the O-rings and readjust the brakeband.